Tags: ALG, Chris Dodd, Financial Reform, Financial Takeover Bill, S3217, Bailout, Government Seizure, Takeover, To share or post to your site, click on "Post Link". Please mention / link to the ARRA News Service. Thanks! 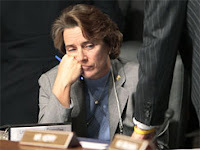 Reason.tv: Last month's biggest busybody was the New York politician who's waging a war on salt. This month's top honors could have gone to the Arkansas US Senator Blanche Lincoln who wanted to block betting on box office sales or to the Silicon Valley politician yanked toys from kids' happy meals. "Nanny of the Month" [Video]is written and produced by Ted Balaker. Editor: Alex Manning; Associate Producer: Paul Detrick; Animation: Meredith Bragg. Tags: Nanny of the Month, Reason.tv, Blanche Lincoln, Scott Hunter, TEA Party, Arkansas, North Carolina, California, box office sales, happy meals, flags To share or post to your site, click on "Post Link". Please mention / link to the ARRA News Service. Thanks! Rasmussen Reports: says, "Support for repeal of the recently-passed national health care plan remains strong as most voters believe the law will increase the cost of care, hurt quality and push the federal budget deficit even higher." Support for repeal is proving to be just as consistent as opposition to the plan before it was passed into law. Rasmussen also identified that there is a huge gap between the Political Class and Mainstream Americans on the new health care law: 82% of Political Class voters oppose repeal while 71% of Mainstream American voters take the opposite view and favor repeal. And we wonder why are elected politicians and staffs are out of touch with the people. They don't care and they refuse to listen. The More the Public Learns, the More They Want It Repealed! Tags: Rasmussen Reports, Health Care law, Obamacare, poll, repeal it, repeal health care, increase cost, insurance companies, Barack Obama, To share or post to your site, click on "Post Link". Please mention / link to the ARRA News Service. Thanks! CitizenLink: The U.S. Supreme Court ruled today that a veterans memorial cross currently covered up by a box in California's Mojave Desert can stay right where it is. In a 5-4 decision, the court agreed that the 9th Circuit decision holding the memorial unconstitutional needed to be reversed, even though there were not five votes for any particular legal basis for the reversal. The case now goes back to the trial court level. 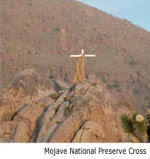 The lower court order was the result of a suit filed by the American Civil Liberties Union in 2001 on behalf of a former Mojave Preserve employee who claimed to be "offended" by the cross. "It is a disgrace that this memorial to our fallen veterans has been covered in a box of plywood for 10 years while the case made its way to the U.S. Supreme Court," said Kelly Shackelford, president and CEO of Liberty Institute, which represents Henry and Wanda Sandoz, the longtime memorial caretakers, and more than 4 million veterans through the VFW, The American Legion, Military Order of the Purple Heart, and the American Ex-Prisoners of War. "We applaud the Supreme Court for overruling the decisions below, but this battle is not over. This box must come off. No war memorial with religious imagery is safe until the court rules that these memorials, which serve to remember our fallen heroes of the military, are allowed under the Constitution." Various forms of the memorial cross have existed at the location since 1934, when the Veterans of Foreign Wars placed it at its current spot. In 2004, Congress authorized the transfer of one acre of land under the cross back to the VFW, a private organization, in exchange for five acres of other land. The ACLU argued that the land transfer was unconstitutional, and a district court judge agreed. 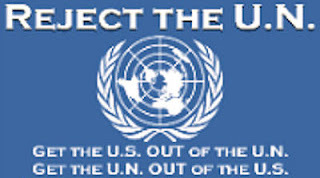 The 9th U.S. Circuit Court of Appeals upheld the lower court's decision. Tags: cross, Mount Soledad, California, SCOTUS, Supreme Court, ACLU, veterans memorial cross, Ninth U.S. Circuit Court, Mojave Desert To share or post to your site, click on "Post Link". Please mention / link to the ARRA News Service. Thanks! Today, in the House, they will vote on the Puerto Rico Democracy Act H.R. 2499 which some are identifying as a rigged referendum process to favor Puerto Rico being admitted as the 51st state. After reviewing the proposed law stipulating a proposed ballot, this bill appears to be an effort to confuse the voters of Puerto Rico. The bill will force a vote not on being a state but on do you want to retain the status quo in Puerto Rico which force Puerto Rico to vote to change the present Territorial relationship. The citizen's of this Territory should decide on one issue without any complications or bias in the process. They have voted three times against becoming a state. Now, they have being asked to vote on this complex measure. They can and should be able to vote without our interference alone. In the Senate: Prior to an agreement yesterday to begin floor debate on the bill that came after Democrats promised concessions on bailout language, the Senate failed to invoke cloture on the motion to proceed to the Dodd bill by a vote of 56-42. 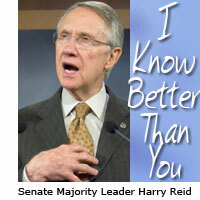 The Senate will again resume consideration of S. 3217, the Dodd financial regulation bill. No amendments will be in order until Dodd offers his substitute amendment. A number of amendments are expected from both sides and votes on some are possible this afternoon. If Democrats really want to pass a bill to rein in Wall Street and help Main Street, they need to drop the political games, follow through on their commitment to remove bailout provisions, and join with Republicans to ensure that onerous regulations don’t crush businesses across the country that had nothing to do with the financial crisis. 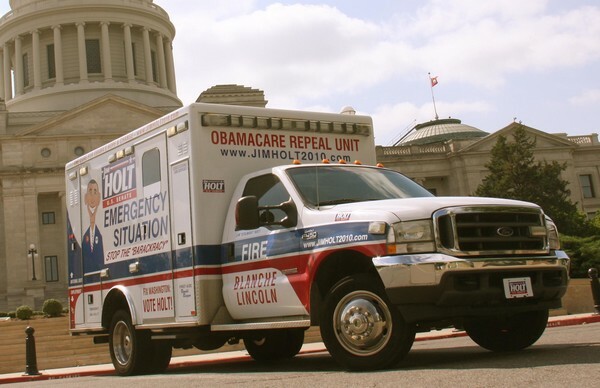 Bill Smith, Editor: Two Arkansas Republicans running for the US Senate have rolled out their special campaign vehicles with messages addressing the liberal agenda. The two are Jim Holt and Gilbert Baker. 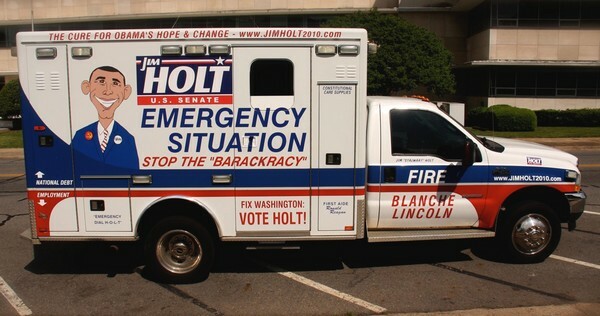 Messages on Holt ambulance is taking shots at incumbent Democrat Sen. Blanche Lincoln. Baker bus messages are taking shots at fellow Republican candidate Rep. John Boozman as well as at Sen.Lincoln. 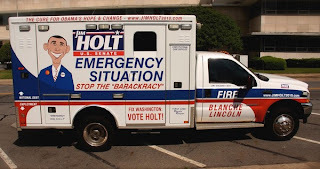 Holt introduced the 2004 Ford F450 former emergency ambulance that several Holt supporters and volunteers have modified to read "ObamaCare Repeal Unit" in bold print on the face along with phrases like "Stop The Barackracy" and "The Cure for Obama's Hope & Change." 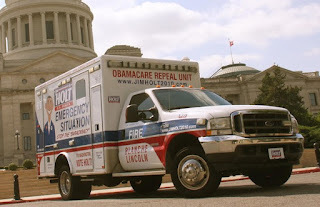 In addition, America's Ambulance touts a caricature of President Obama with a Soviet hammer & sickle insignia affixed to his lapel while the other side displays a cartoon sketch of Sen. Lincoln posing alongside Sen. Harry Reid & Rep. Nancy Pelosi next to the words "Revive America: Vote Jim Holt for U.S. Senate." Hold said, "The current administration is cramming their liberal agenda down the throats of the people in much the same way - with no thought for the American public. When you attack the leader of the most Socialist minded progressive agenda our nation has ever seen, it is bound to cause quite a stir. "We are speaking out and representing Americans who have not had a voice in Washington that represents them. With recent attacks on freedom and liberty, citizens need a leader - someone who will fight to defend their Constitutional rights." Holt reiterated, "The illustration in America's Ambulance harnesses the momentum we need to drive us through to victory in November. Then we will head for the ER — Economic Recovery." Baker is using a bus for his three-day “No Bailouts Bus Tour," stopping in Conway, Little Rock, Cabot, Searcy, Heber Springs, Mountain View, and Marshall. 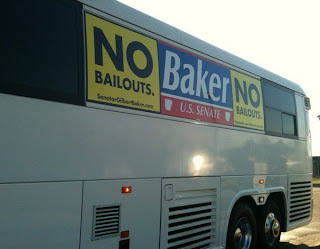 The tour highlights Baker's opposition to big government bailouts and his support for fiscal responsibility in Washington D.C. “It's time to say 'no' to big government bailouts," Baker said. "My opponent, Congressman John Boozman, voted for the TARP bank bailout, and people I've talked with today agree that someone who's been part of the DC problem can't fix the DC problem. I would not have voted for the bank bailout and I call on Congressman Boozman to join me in pledging to vote against any government bailouts in the future. Tags: US Senate, Arkansas, campaigns, vehicles, ambulance, bus, Jim Holt, Gilbert Baker To share or post to your site, click on "Post Link". Please mention / link to the ARRA News Service. Thanks! Instapundit: Feds are in default on their “protection against invasion” responsibilityOriginally Posted at Blogs For Borders. Tags: Arizona, Jan Brewer, law, enforcement, news, illegal aliens To share or post to your site, click on "Post Link". Please mention / link to the ARRA News Service. Thanks!